A busy Day 5 of the 2011 PokerStars World Championship of Online Poker at PokerStars saw four new champions crowned. Jim "Mr_BigQueso" Collopy was almost one of them but came up short after a grueling duel in the $200 Razz tournament that saw heads-up play last nearly two hours. Also making final tables on Day 5 was 2011 WSOP Bracelet winner Viacheslav "Amke" Zhukov and Australian phenom James "Andy McLEOD" Obst. History was on the line when Day 2 of the No-Limit Hold’em Ante-Up tournament resumed on Thursday. With six career WCOOP final tables already under his belt, Aussie poker pro James "Andy McLEOD" Obst had a chance to become the all-time leader. And with only 12 of the original 1,467 players surviving Day 1, it didn't take long for Obst to secure number seven. Former PokerStars Sunday Million winner Steven "SvZff" van Zadelhoff was the bubble boy of the event when his lost to "vitalya155's" . With antes at 7,000 per player and the blinds at 5/5, "vitalya155" opened to 11,110 from under the gun. Sweden's "deluxe" called from middle position and a short-stacked van Zadelhoff moved all-in for 284,013. Only "vitalya155" called, and the board rolled out to send van Zadelhoff to the rail with $3,697. That opened the record books for Obst who began the final table fourth in chips. The board ran out and the pocket kings held to give "BILLIE1971x" the overall chip lead. Obst, meanwhile, earned $4,533 for ninth place, and "Big_Nemo" was eliminated on the very next hand when his finished second-best to "andyhin22's" . Lithuania's "Ugnis" then took control of the final table, and it was a gruesome hand that sparked his rise to the top of the chip counts. With the antes at 12,500, "BILLIE1971x" raised to 31,277 and "Ugnis" called from the button. On the flop of , "BILLIE1971x" led out for 77,324 and "Ugnis" min-raised to 154,648. "BILLIE1971x" then three-bet to 378,644 and "Ugnis" called. The turn brought the and "Ugnis" elected to call a bet of 421,288, leading to the on the river. "BILLIE1971x" moved all-in, having his opponent covered, and "Ugnis" quickly called for his remaining 483,601. "BILLIE1971x" tabled for trip kings, but his hand was outdone on the river as "Ugnis" revealed for a winning full house. That gave the Lithuanian a lead he never relinquished. Following a slew of eliminations, "Ugnis" added to his enormous stack by tangling again with "BILLIE1971x." With only three players left and antes at 30,000, "Ugnis raised to 45,555 from the small blind with and then called a shove of 819,053 from "BILLIE1971x," who had . The on the flop was all "Ugnis" needed to eliminate "BILLIE1971x" in third place and begin heads-up play with a 3.4-1 chip advantage over Russia's "vitalya155." The match lasted 68 hands, but "vitalya155" was never able to close the gap against the intimidating stack of "Ugnis." The Russian player ultimately bowed out when he ran into , giving the Lithuanian "Ugnis" his first WCOOP title. He collected $73,717 and a WCOOP bracelet for his two days of work. Players began each match with 5,000. When Day 2 of the $200 No-Limit Hold’em Heads-Up began, 64 players who had survived six rounds of heads-up action on Day 1 set themselves on a journey to win six more matches and win a WCOOP bracelet. 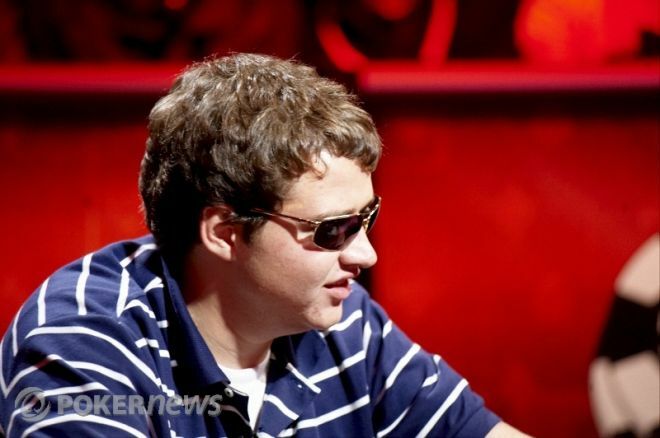 Team PokerStars Pro Martin "AABenjaminAA" Hruby was one of them but was eliminated in the sweet sixteen. Michael “wywrotX” Wywrot made quick work of “mikki696” after whittling his opponent down to a stack of 20 big blinds during Level 2. On the final hand, Wywrot three-bet shoved with and was called by his opponent who held . An board did not save “mikki696,” who was eliminated in eighth place. Having built up a greater than 4:1 chip lead, “crossybig” closed out Thierry "BOKPOWER" van den Berg with a bit of luck. All-in preflop with , van den Berg looked primed to double up against “crossybig” who was holding . However, the board ran out , giving “crossybig” a pair of eights and a ticket to the final four. For “rickv17”, it was a matter of good timing. With a 3:1 chip lead, “rickv17” picked up on the button and min-raised. “Love2Spl00ge” shoved with from the big blind and, of course, “rickv17” called. The board fell to send “rickv17” to the next round. After jumping to a quick lead, “jenbizzle” ran into quite the cooler. With the blinds at 30/60, “jenbizzle” opened to 120 and “crossybig” called to see an flop. “Crossybig” check-called 120, bringing the turn to the board. Once again, “crossybig” check-called a bet, this time 320, delivering the on the river. A third check from “crossybig” led to a third bet from “jenbizzle,” this one for 899. However, “crossybig” threw in a raise all-in, sending “jenbizzle into the tank for a few moments before calling with for trips. It was second best to “crossybig's” , who went on to win the match a few hands later. The 186-hand match did not start well for “rickv17” who was unable to get much going on. However, a key double-up at 50/100 changed the momentum. With a 3:1 chip lead, “crossybig” min-raised to 200 on the button. A reraise all-in from “rickv17” led to the cards being on their backs. “Rickv17” showed and was leading the held by “crossybig.” The board rolled out to even out the stacks. From that point forward, “rickv17” took control of the match and closed it out. On the final hand at 60/120, “crossybig” shoved for 1,040 with and “rickv17” called holding . Both players paired their ace when the flop arrived, but “crossybig” came up short when the turn and river ended the tournament. For his excellent showing, “rickv17” took home a WCOOP bracelet and $75,616. Despite not having the chip lead when the $200 Pot-Limit Omaha Hi/Lo Six-Max 1R1A reached the final table, 2011 WSOP bracelet winner Viacheslav "Amke" Zhukov was certainly the man to beat. After all, he did win the $10,000 Omaha H/L World Championship in June. Here were the chip counts entering the final table. Even though he began the final table with the chip lead, “jjsbryan” exited in sixth place. The key hand came against “Tlick777" when “ jjsbryan” committed 90 percent of his stack with on a board. “Tlick777” wasn't going anywhere with and took down the pot with trip nines when the river fell. A few hands later, “jjsbryan” hit the rail. A short-stacked “Tumppi82” went all-in with and was looked up by the of “madalain” in the big blind. The board ran out , giving “madalain” trip threes to score the elimination. The next 40 minutes of play were spent hashing out a deal which ultimately did not come to fruition. So action continued and Zhukov busted next, shoving on a board with . A call from “madalain” with left Zhukov drawing thin. The turn gave him outs to a flush, but it didn't come since the river fell, leaving three players left in the hunt. “Tlick777” fell at the hands of “madalain”, as well. All-in preflop for what would have been a chip leading pot, “Tlick777” fell with to “madalain's” . The board ran out to give “madalain” aces and queens to win the pot and take more than a 3:1 chip lead into heads-up play. More than 3,500 entered. Only 16 remain. Day 1 of the two-day six-max knockout moved quickly on Thursday as 99.6 percent of the field was eliminated. A handful of notables, however, are still in contention for the $110,600 prize, including Andras "probirs" Nemeth, Aaron "JeanGrae" McCready, Aaron Been, and former Spring Championship of Online Poker (SCOOP) champs "nikov" and "Sir_winalot9." Nemeth, a poker pro from Hungary, takes a sizable chip lead into Day 2. The Budapest native has several large scores on his resume but could claim his first six-figure payday on PokerStars with a victory on Friday. McCready and Been are also accomplished online veterans but, like Nemeth, they lack a major series win on the world's No. 1 poker site. The sole Razz tournament on the schedule attracted a field of 799. "Fred_Brink" entered the final table as the chip leader and a hand played against Stephen "stevie444" Chidwick with two tables remaining was a big reason why. Chidwick completed on third street and "Fred_Brink" called. The action the rest of the way was the same as Chidwick was the aggressor the entire time while "Fred_Brink" called him down all the way to the end. Chidwick, with / / , was unable to shake "Fred_Brink's" / / at any point in the hand. Chidwick busted in 11th shortly thereafter while "Fred_Brink" led the way into the final table. "Ig123456789" was the first to bust after being left with less than an ante. In a hand against "Fred_Brink," their respective boards read like this: "Ig123456789" held , and "Fred_Brink" showed . "Ig123456789" completed on the third street, then called a raise from "Fred_Brink." Having taken the lead on fourth street, "Ig123456789" bet. "Fred_Brink" called, raising "Ig123456789's" fifth-street bet. Sixth street saw "Fred_Brink's" lead-out bet get called. On seventh street, "Fred_Brink" bet, but "Ig123456789" folded with half an ante left and busted the following hand. "1337Gambl0r's" remaining chips went into the middle on fifth street with / against the / of "Kecinpulach." A on sixth and on seventh gave "1337Gambl0r" an 8-6 low, but "Kecinpulach" managed a 6-5 low with a on sixth and a on seventh to win the pot. Vincent "Diamond8" Gabel busted next, defending a king bring-in. Although he caught Jim "Mr_BigQueso" Collopy raising with a queen in the hole, both wound up making two pair and their face card played. Collopy's queen low bested Gabel's king low. The short stack at the start of the final table, "texaspl" waited patiently to get all-in with good holdings. Well, / is pretty darn good. "Fred_Brink," though, had a nice starting hand, as well, with . An for each on fourth street gave "texaspl" a wheel draw and "Fred_Brink" 6-5 draw. Fifth street delivered a for "Fred_Brink" and "texaspl" was unable to pull better than an on the following three streets. Eleven hands later, "Kecinpulach's" / had "donat1505's" / all-in and at risk. Three pairs later, "donat1505" was out the door as "Kecinpulach" 10-9 low took it down. That pot didn't matter much, though, because just two hands later play was heads-up. "Fred_Brink" rallied from behind with / against "Kecinpulach's" / . A 9-6 low was what "Fred_Brink" managed, while "Kecinpulach" painted and bricked to a J-10 low, busting in third place. It only took a half-hour to get to heads-up play and it was between the two big stacks at the start of the final table. "Fred_Brink," with 2,408,199, led Jim Collopy's 1,586,801. After nearly two hours of back-and-forth action, "Fred_Brink" pulled away. On the final hand, Collopy made a stand with / against "Fred_Brink's" / . Having committed much of his stack already, Collopy had little choice but to put the rest of it in when he was dealt a on fourth street to "Fred_Brink's" . "Fred_Brink" had it locked up on sixth street to win the WCOOP bracelet and $29,962.50.